The Western Hemisphere has reason to celebrate… The Revolutionary Armed Forces of Columbia finally agreed to end the longest running armed conflict of the Americas. Colombia’s Marxist FARC (“Fuerzas Armadas Revolucionarias de Colombia”) rebel group began as a peasant uprising against the national government in 1964. The group’s ideologies encompass Marxism, the antithesis of capitalism, and advocates for values such as “from each according to his ability, to each according to his needs.” Colombia’s President, Juan Manuel Santos, has been in negotiations with the group for the past four years. Although the peace accord has Santos’ blessing and FARC’s acquiescence, the Columbian nation will keep its fingers crossed that voters approve the deal in a national referendum. The peace agreement will wrap up over a half a century of conflict, close to a quarter of a million deaths, and over 5 million internally displaced persons (IDPs) in the ravaged nation. (Some estimates of the FARC conflict even have the number of IDPs in Colombia upwards of 8 million.) The controversial peace pact will grant rebel combatants amnesty for any and all crimes committed during conflict. This reality is painful for many in the country who’ve witnessed FARC forces thrive though kidnapping, extortion, and involvement in illicit drug trade. Additionally, the accord will allow rebel forces to form a political party and seek political office. The deal will also have a profound impact on Columbia’s illegal narcotics industry as it requires farmers to destroy coca plants- the source of cocaine manufacturing. This land will then be redistributed to former FARC rebels and facilitate new crop industries directed towards job creation on their behalf. 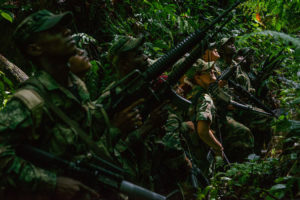 As FARC forces step down from cocaine trading, an event anticipated with both optimism and skepticism, this begs the question of who may be waiting in the wings of the jungle to claim control of the lucrative drug crop which supplies about 60 percent of the world’s cocaine. After all, these billions of acres of emerald green coca crops have brought in $2.4B – $3.5B annually for the FARC organization, and that is not an effortless surrender. Arguably its greatest accomplishment, the peace agreement calls for the release of child soldiers. The first group of minor ex-militants was released to the Red Cross this past week, with FARC leaders stating “We the FARC believe that the outing of minors from war zones is only the first step towards a better future for new generations.” The Colombian army estimates that roughly half of its soldiers became FARC combatants as children. This relentless recruitment of children over the past fifty-plus years constitutes egregious abuse to the minors’ innocence, in violation of several human rights conventions, and is recognized as a war crime under the Rome Statute of the International Criminal Court. In 2000, the world’s first international treaty focused on ending the military exploitation of minors came into being- OPAC, the Optional Protocol to the Convention on the Rights of the Child. The treaty prohibits the conscription of children under the age of 18 and their participation in hostilities. It also prohibits the voluntary recruitment of children by non-state armed groups, although it allows state armed forces to recruit from age 16, as long as the children recruited are not sent to war. However, the promise of peace may not be the end of struggle for these “child soldiers,” but rather a different beginning as it will be the first time some of the insurgents have surrendered arms in their lifetime. Furthermore, the former soldiers will likely need appropriate DDR (Disarmament, Demobilization, and Reintegration) programs to facilitate their successful re-entry into a society of post-conflict peace- without arms. If history has taught us anything, it is that violence begets violence. While the ceasefire may be a wonderful beginning to peace within Colombia, there are still many ancillary hurdles that the nation will need to overcome as a unified front. Nonetheless the peace accord is a giant step towards an end of possibly not acceptance, but certainly understanding, between Santos’ government, FARC forces, and the nation’s people. It is an agreement that highlights the country’s determination and cooperation… and most deserving of the world’s respect and praise. Tahli Salem is a third year law student and staff editor on the Denver Journal of International Law and Policy. Colombia has struggled for decades to combat the illegal drug trade, terrorism, and violence that FARC (Fuerzas Armadas Revolucionarias de Colombia) has contributed to since 1966. 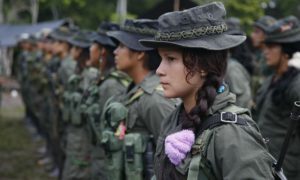 Known for being one of the richest guerrilla armies in the world, FARC has approximately 8,000 rebel fighters that control many rural areas in the south and eastern portions of the country. Most of the economic support for this guerrilla group comes from the illegal drug trade, profits from high profile kidnappings, extortion, and “taxes” it collects from those individuals who reside in areas that they control. Many administrations have tried to bring peace to Colombia by eradicating, fighting, and even negotiating with FARC, none of which have been successful until President Juan Manuel Santos came into office. On August 24, 2016, the Colombian government announced a cease fire peace deal with FARC rebels, putting an end to the 50-year conflict. In the same peace deal, the FARC agreed to set free the children soldiers they kidnapped and enslaved to serve in its army. But what did Colombia and its government really have to sacrifice in order to strike this peace deal? FARC is known to have committed massacres, kidnapped, extorted, and forced children into labor and servitude. These crimes are internationally condemned. However, now that this treaty will be put in place, those FARC members who will confess to their crimes, will get reduced sentences, in many instances community service. Is community service a fair punishment for those who have committed human rights violations for 50 years? Colombian Ex-President doesn’t seem to think so. Alvaro Uribe, has publicly criticized the cease-fire as an amnesty and has accused President Santos of being a traitor. Part of this criticism is rooted in the idea that the peace deal seeks to reintegrate FARC members into society and transition members from war-mongering guerrillas to a peaceful political movement. Can that be classified as impunity? President Santos claims that the individuals responsible for violent crimes will receive punishment commensurate with the crimes they committed. That is yet to be seen. A large percent of the Colombian population seems to be in favor of the deal. However, a point of contentious negotiations that has not been agreed to, has been FARC surrendering its control of drug trafficking in the region. As the United States State Department has illustrated, FARC is responsible for the production and distribution of several tons of cocaine entering the U.S. every year. The world continues to watch the negotiations and execution of this peace deal. Those who are watching closely, are human rights watch groups and foreign administrations looking to see if this deal amounts to impunity for human rights violations. Colombia’s largest rebel group, Revolutionary Armed Forces of Colombia (FARC), recently acknowledged that its actions have affected citizens in the nearly 50 years of internal conflict. This is the first admission of this kind by FARC. Going further, Farc has stated that its rebels are ready to take responsibility for their actions during the 50 years of conflict in Colombia. FARC joined negotiations in Cuba with the Colombian government in November 2013. The purpose of the talks has been to get FARC to sign an agreement in which it renounces its armed struggle in order to join the legal political process and stop the internal conflict, and to provide for victim reparations. However, as a part of working towards an agreement on disarmament and the eventual implementation of a peace deal, FARC is expected to seek an amnesty agreement. A march for those enslaved by Mexico’s drug cartels. Several important questions emerge from FARC’s admission. First, what type of reparations are appropriate, when family members are still searching for over 400 victims who were kidnapped by FARC and went missing between 2002 and 2011? Second, should FARC members receive amnesty, or is that in conflict with the notion of FARC taking responsibility for their role in the violence? In order to determine what type of victim reparations are appropriate, it is important to understand the nature of the conflict. The conflict in Colombia has claimed around 250,000 lives and displaced over 5 million people. The majority of killings were carried out by the Colombian army, police, and state-linked right-wing paramilitary groups, including FARC. Between 2002 and 2011, it is alleged that rebels kidnapped 2,678 civilians, and that more than 400 of these victims are still in captivity or have gone missing. Members of victims’ associations such as Los Que Faltan, or “Those Who are Missing,” state that they are not opposed to the peace process, and support it, as long as there is transparency with what has happened to the victims. Other victims rights groups have stated that they do not want peace talks to advance unless FARC is willing to provide answers to the families of those victims that have been kidnapped or disappeared. During the peace talks, FARC commanders have stated that the rebels no longer hold any captives. This leaves family members of missing victims with little in the way of hope of finding their loved ones. Farc has also threatened throughout this process that without government concessions, peace talks will fail. The group states that unless the government is willing to guarantee the rights and security of the opposition and cease killing guerrilla commanders in the field, the peace talks will not succeed. Thus, FARC has provided few answers to the families of victims, and has only demonstrated willingness to take responsibility to the extent that members receive amnesty for their actions. Parties involved in the talks have argued that in order to truly find a solution, it must address the roots of conflict. Integral in this process would be acknowledgement of the violence caused by FARC, for FARC to provide answers to the many families with missing family members and little in the way of answers. It is unlikely that the peace process will be successful, or that victims and their families will accept any sort of reparations without getting the answers that they are looking for. It remains to be seen whether FARC’s admissions and willingness to take responsibility will include providing victims and their families with meaningful reparations and the answers they have been searching for. With regard to the issue of amnesty, the same perpetrators that have been responsible for large-scale human rights abuses, which have continued and in some cases increased despite the peace process, are now seeking integration into the Colombian political process. Providing amnesty to these perpetrators of violence and integrating them into the legal and political process would send the wrong message to victims, delay the peace process, and could potentially result in violence. When FARC last attempted to take part in electoral politics, several thousand members and elected officials were murdered. Even if FARC agrees to victim reparations, it is unlikely that the integration of these perpetrators into the political process will be welcomed by victims and their families, and even less likely that they will support the continuation of peace talks. The question remains what recourse victims will have if FARC opts not to provide victims and their families with the information they are seeking regarding the whereabouts of missing persons. FARC negotiator Jesus Santrich stated that any punitive measures would have to be taken by an independent tribunal, not the state or its “corrupt and venal judiciary.” If the Colombian government agrees to amnesty or refuses to prosecute for crimes committed by FARC member over the 50 years of violence, members of the international community may call for an independent tribunal to investigate crimes committed by FARC members. Emily Boehme is a 2L law student at the University of Denver Sturm College of Law and a Staff Editor for the Denver Journal of International Law and Policy.